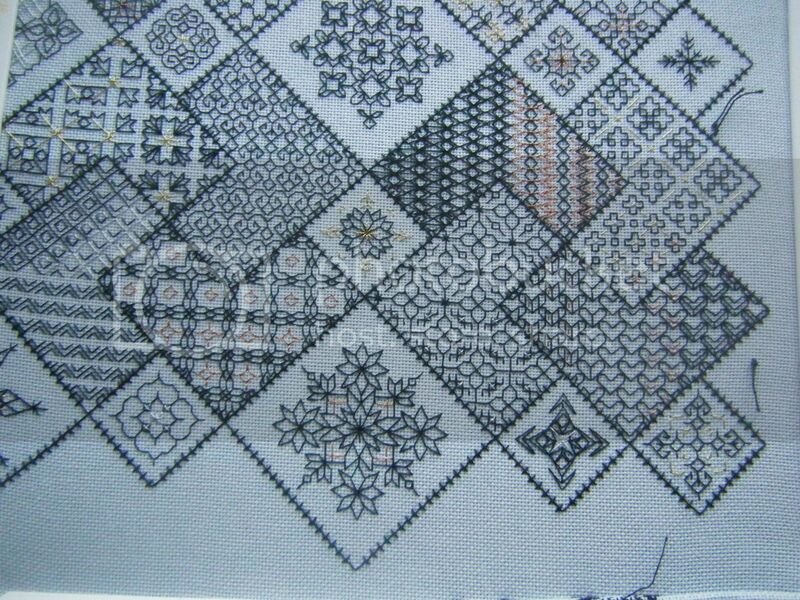 It's time for another update on my Save The Stitches blackwork sampler designed by Elizabeth Almond of Blackwork Journey. I've entered this into the Quilt and Stitch Village show in April. I need to get it framed before then so I've given myself the deadline of the end of February to get it stitched. I finished the section below, then I started crocheting squares?!? How exactly is that helping get it finished Wendy? I have finished blocks 18, 19 and 20, including the metal thread work. This means I have one full row to do (made of 4 blocks), then I just have to add the beading before getting it framed. Someone kick me in the arse please, I need to get working on this! Wow! This is spectacular and jaw dropping! I love it! It's just beautiful! Now, put down that crochet and pick up your needle again. This lovely thing deserves to be finished, and anyway, you've got a show to enter! Consider yourself virtually kicked, if that would really help! It's quite lovely, Wendy, and you've put in a LOT of work so far - you're in the home stretch now! Consider this a proverbial (and maple syrup :D) kick in the patootie to git 'r done! You're going well Wendy - and now you have a deadline you'll have to make this your top priority and finish it quickly. It is a beautiful design, and your stitching looks lovely. I love your "then I just have to add the beading " comment as though that will only take five minutes! Get your skates on girl you have an exhibition to enter!!! I can't wait to see this when it's all finished and frame! The glimpses you've given us have been stunning and I imagine it will be even more so when it's done. Hello Wendy... I've loved this since the first time you posted about it. I've just started a new weekly Stitchery Link Party on Mondays in conjunction with my Vintage Embroidery Monday and would love it if you'd come link up this post and any others you'd like to link up that feature your embroidery and cross-stitch.